Elbow's success has been hard-won. 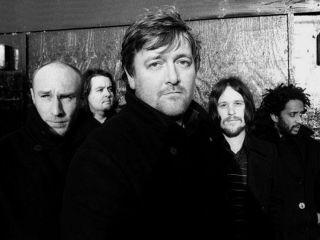 Elbow's Mercury Prize win this week was a victory not just for their album, The Seldom Seen Kid, but also for the notion that it is possible for a band to enjoy a long and fruitful career in today's music business. The Manchester five-piece have been releasing records for 18 years, and have managed to overcome the setback of being dropped by V2 in 2006. But don't think that success and longevity come easily - you'll have to work very hard if you want to get to the top and stay there. So if you plan to make music your living, consider MusicRadar's ten survival tips. You won't get very far by only being 'good enough'. The music world is more competitive than ever, so turning a profit on your music is dependent on you turning out the best product you can. Aim to be the best artist working in your chosen field; it'll be harder than just running with the pack but the satisfaction of getting to the top of the pile will be worth it. If you're aiming to succeed in the commercial arena, you need to know about the latest developments at both the business and artistic ends of the industry. Subscribe to MusicWeek for the latest UK-based business news, and Billboard Magazine for the view from the States. You'll also need to be reading the consumer and specialist music press on a weekly and monthly basis (plus MusicRadar, of course). Don't forget that there are also many excellent music blogs out there that can keep you in the loop 24 hours a day. This is what everyone else is doing. The world doesn't need another Timbaland wannabe, but it does need plenty of music that meets Timbaland's high standards. Don't forget that, by the time you've spotted a bandwagon, you've already missed it. What's the point of having 100,000 plays on MySpace when you have no music for sale there? The only point in promoting yourself online is that your listening and viewing public will eventually send some money your way. How long can you afford to work on your music without seeing a penny in return? It pays to always have an answer to the question: 'What's in it for me?'. If you can't answer that question in one simple sentence, you're channelling your energy in the wrong direction. Maybe you're already selling your music, but do you know exactly how much profit you're earning? Do you have any idea of the realistic maximum amount you're likely to collect through sales, gigs, merchandise and so on? Do you know how much each of these endeavours is costing you to set up? Dedicate an afternoon every month to look at your accounts so you can see where all the money's going. You are keeping accounts, aren't you? Think of all the effort you're putting into getting your name out there to a wider world. People might know who you are, but what else can you do with your newly found profile? There are many ways you can capitalise on heightened awareness: DJing, merchandise, branded water and perfume are only a handful of ideas that major artists have used in the past to generate more profit. Your only limit is your imagination (and what people will pay for, of course!). If you intend to be a megastar then your music will have to sell across the world, and you'll have to travel it too - possibly for many years. Can you do that? You want your career to last as long as YOU want it to, right? Plan to be around for decades, because you won't be if you don't. Remember that the best-laid plans often change: be flexible, but always keep those long-term goals in mind. No one ever got anything worthwhile done by being negative. You need to keep a positive state of mind as long as you can to truly succeed in this game. Consequently, you may need to avoid other people who only have negative things to say about the music industry (and there are a lot of them around at the moment). Choose who you listen to very carefully. You need to be out there every day, networking with musicians, managers and other record business types. You need to make sure you're securing as many contacts, finalising as many deals and playing as many shows as you can each and every week. Nothing ever happens purely by chance; so make your own luck by working hard.